"We can feel lonely even when we’re surrounded by many people. We are lonely together. There is a vacuum inside us . We don’t feel comfortable with that vacuum, so we try to fill it up or make it go away. Technology supplies us with many devices that allow us to “stay connected.” These days, we are always “connected,” but we continue to feel lonely. We check incoming e-mail and social media sites multiple times a day. We e-mail or post one message after another . We want to share; we want to receive. We busy ourselves all day long in an effort to connect." As Thich Nhat Hanh reminds us, we actively avoid silence by filling our lives with as many things as possible. Those things can be electronic devices as Hanh describes, or they can be check-points on a massive to-do list that just keep us busy to avoid the silence of loneliness. Truth is, we can avoid the loneliness that the job of leadership brings with it by filling the vacuum of silence. Instead, we need to welcome the silence. But as Thich Nhat reminds us, “Silence is essential.” It is the silence that gives us time for us. It is here in the silence that we can begin to look deeply and find out who we are. Is that not ultimately what we want as leaders? To become authentic, we need to shut down the noise around us long enough to connect with who we are instead of Facebook or Twitter. Hanh, Thich Nhat (2015-01-27). Silence: The Power of Quiet in a World Full of Noise (p. 24). HarperCollins. Kindle Edition. 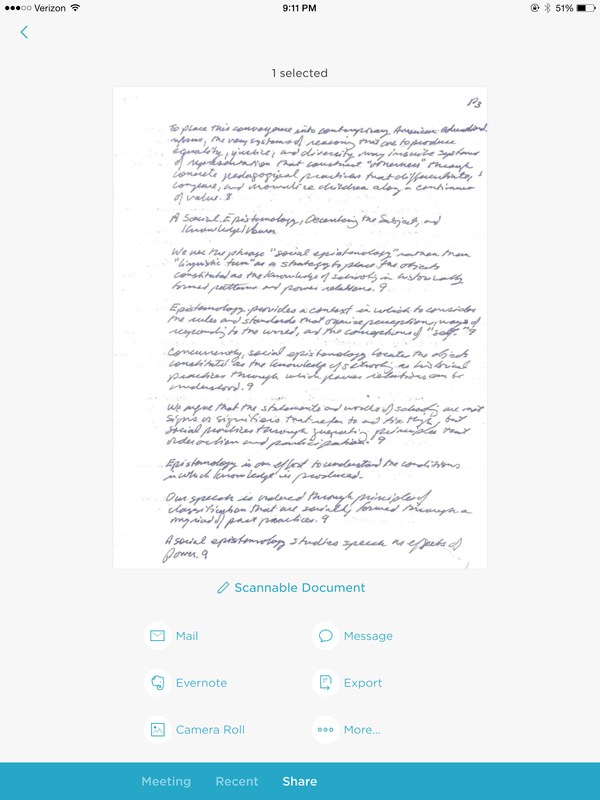 Evernote just got even more useful for me with its new iOS app Scannable. In many of my past posts regarding Evernote, I have made it clear that the Evernote note taking application is my everyday "go-to" app in both my professional and personal life. With all the smartphone apps, desktops apps, and browser extensions, Evernote makes note taking and web curation simple and easy. Now, they've added an iOS app called Scannable. With this app, you can scan any document with your iPad or iPhone. You can then send it to someone by email, upload it to an Evernote notebook, place it in your photos, send it through the messaging app, or export it any number of your iCloud apps. It's rather simple interface is an added benefit. Evernote's Scannable is definitely another one of those apps you'll want to download and use with your iOS devices. Scannable is excellent choice for quickly capturing any document, whether it be a handwritten note, receipt, memo, or sticky note. Today, the North Carolina Department of Public Instruction released the school report cards mandated by North Carolina’s legislature. (See those here.) These report cards graded each school with a letter grade A-F. Once again, our state has taken a step backward into absurdity with this action. Grading all the things our schools do with a single letter grade reduces, once again, what matters in North Carolina schools the most, to test scores. Once again, our state has elevated state testing to even higher stakes. Schools will now work in earnest prepping students for tests and getting those numbers up. But elevating test scores is not only what this exercise in madness does; it also clearly demonstrates what’s wrong with education, and society, in North Carolina. In its article entitled “NC Public School Letter Grades Released, Reflecting Student Family Incomes,” The News and Observer sums up the real truth we learn from these report cards. “Among the schools where 80 percent or more of the students qualify for free and reduced lunch, 81 percent received a D or F. Only one of those schools got an A. At the other end of the spectrum, more than 90 percent of schools where fewer than 20 percent of the students qualify for free and reduced lunch received an A or B. Only one of those schools received an F."
In other words, our legislature and North Carolina Department of Public Instruction hasn’t come up with a test at all on how our schools or do; they’ve developed the perfect test for poverty. In fact, it really shows that North Carolina’s barrage of tests are great for indentifying students who live in poverty! Probably much better than actually measuring student achievement. Sadly though, I suspect the motivation behind this A-F grading system isn’t really about improving public education at all. After all, our North Carolina State Legislature proved during its last session it is no friend to public education, why would we expect different.? No, this grading system is simply another attempt by our political leaders to drum up or even manufacture false charges of failure so that they can continue to push their pet project of school vouchers and their blind obedience to free markets.